From Lord Walter Fitzgerald, F.R.S.A.I. Connor Roe’s body was taken and buried with great pomp in the Abbey of Burren (now called Corcomroe Abbey), which, as before mentioned, was founded by his grandfather. 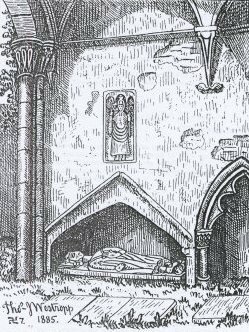 This effigy of King Conor O’Brien, and that of Felim O’Connor, King of Connaught, who died in 1265, and was buried in Roscommon Abbey, are the only two royal effigies known to exist in Ireland; both are of limestone, of the same date, and are twin-like in appearance, dress, and attitude. This tomb is placed in a niche on the north side of the choir; the slab measures 7 feet in length, and is wider at the top than at the bottom, being 26 inches in width at the head and about 18 inches at the foot (the corner near the left foot is broken away); as it probably formed the lid to a stone coffin, there are no sides to it. The figure is clothed in a long loose robe, reaching from the neck to half way down the calves; the sleeves fit close, and cover the arms to the wrists; over the robe is hung a mantle, falling from the shoulders to the ankles. The head rests on an oblong block, and is encircled by a crown decorated with fleur-de-lys, now much broken; the hair can be seen at the top of the head, and is arranged in a fringe on the forehead; it falls in long locks over the ears down the neck, curling up at the ends; the face is clean shaved. The right arm is stretched by the side, and the hand holds what was a fleur-de-lys headed sceptre, which lies between the arm and the body, with the head resting on the shoulder. [no date], in Corcomroe Abbey. The left hand rests on the chest, and holds a reliquary which is suppended from a band that runs round the neck between the mantle and the robe. The feet are shod in pointed-toed shoes, having a diamond-shaped opening over the instep; they are secured to the feet by a strap and small buckle, fastening round the ankle. Both feet rest on a block of foliage. This effigy, except for the damage done to the crown and sceptre, is in very fair condition. James Quinn, the caretaker of the Abbey, says he heard that some thirty years ago this effigy used to have a pipe in its mouth, which was knocked off by a man named O’Dowd, now in America; what this could really have been is puzzling; as far as I could see, there was no trace of anything having ever been near the mouth. O’LOUGHLIN KING of | BURREN’S Family Tomb. In a niche in the wall opposite to the one with the effigy, is a baulk of timber, lying on the ground roughly cut, on which is a cross in relief, with the letters Cr O’ Ln incised on it; this marks Connor O’Loughlin’s burial-place. Built into the wall over the king’[s] effigy, is a short limestone slab, on which is carved in relief, an abbot, holding a crozier in the left hand, while the right arm is bent and the hand open except for the last two fingers. The sculpture is unfinished; it was discovered underground, and placed where it now is in 1879. The face is of the most conventional description, though the features have been described as “noble and full of repose,” he wears a pleated tunic coming below the knee, and pointed brogues, open on the instep; his left hand holds a reliquary with bands round his neck, his right a sceptre, which, like his crown, is decorated with a trefoil or lily; he is clean shaved, but his hair falls in heavy locks to his neck. His feet rest on an object (not a dog) carved with fleurs-de-lys; the effigy is about 6 feet long. Over it is set the effigy of a bishop in alb, mitre, and chasuble in a trefoil niche; he holds a spiral-headed crosier in his right hand. “MILES BURKE died May 10th 1787 put up by his son MICHAEL BURKE” (tomb closing north chapel). From Mrs. E. H. Beresford Massy, Mallow, 1901. This erection is built of the rough limestone of the mountain-side, and stands on a circular base of stones, through which the grass, &c., grows freely. A little further on, and on the opposite side of the road, is a place where unbaptized babies are buried.